1) Yenda is the beer arm of Coca-Cola, yet you wouldn’t know it by looking at the label. The phrase ‘‘Coca-Cola’’ appears nowhere on the label, or the six-pack carton. It might appear somewhere on the case but I’m not going to fork out that much money just to find out. Yeah, I paid for this beer. While it seems the rest of the beer-writing world got freebies sent out, I had to hunt them down and pay for them. Some in the beer community are mighty pissed off about Coke jumping into the craft beer market. They swear they’ll never try their ‘‘megaswill’’. Okay, you don’t want to buy their beer – that’s fine. But then you can’t voice an opinion of how it tastes – by calling it ‘‘megaswill’’, for instance. How do you know whether it is if you refuse to taste it? Me, I think more about the taste of a beer rather than who makes it, so I have no dramas about trying some. 2) And the taste? Well, it’s not megaswill. It’s not great either, but it’s not megaswill. For me, it’s like a less interesting Coopers Pale Ale. For those moving from their VBs and Hahn SuperDrys it won’t be a big step – in that way it’s an entry-level beer. But as for me? Well, I’ve got five more bottles of this stuff at home that I’m not going to be drinking. If only the bottle shop attendant would let me buy single bottles. 3) I can tell you this stuff is cheap. I don’t know if it’s an introductory price or not but the six-pack cost me $10. That’s about $6 cheaper than a sixer of VB from Dan Murphy’s. They stick at that price they’ll sell shitloads. 4) Could they have tried harder with the labels? They’re pretty bland – they look like they were labels for the early test batches but no-one actually got around to changing them. 5) They get definite kudos for the incredibly easy-to-read best before date. Most brewers seem to think printing them in dark ink on a brown bottle is the way to go, but that just makes them nigh-on impossible to find. But the Yenda beers have a best before date printed very clearly on the bottle’s label. (2) Make beer damper with it. Beer damper is pretty forgiving about which one you use. A less interesting Coopers Pale Ale? That doesn’t fill me with any confidence haha. 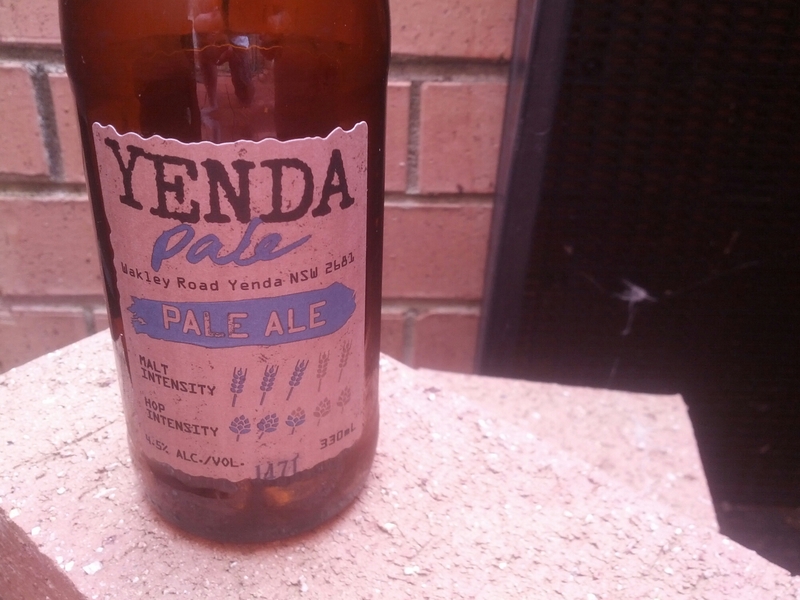 Yenda pale ale is god’s gift to humanity in the beer community. Not only is it a quality brew, but the guys behind this stellar beverage are some of the most top notch brewers in the southern hemisphere. Well done lads you’ve made a beer that Yenda can be proud of. My local IGA is charging 32 dollars for a 6pack of this… I bought the marked down, past the best buy date pack for 8.50. Not bad. Knowing its coke owned I’ll not buy any more! Hi. I asked them about it the next day, said it must have been double scanned. So, only 16 dollars. I bought another marked down 6pack but no way I would pay 16. Sorry about the 32 dollar comment. I should have known! Are we sure it’s owned by coke btw? I saw an article just a few days ago tittled ” cokes first foray into alcohol” or something similar. No dramas Nathan. Hope they gave you a refund. Yenda is made by the Australian Beer Co, which is jointly owned by Coca Cola Amatil and Casella Wines (makers of Yellowtail). CCA also has some other beers, like Fiji Bitter and Vonu lager.